When I invest in stocks I just don’t pick up the stock that everyone is talking about, believe it or not there is a method to my madness. 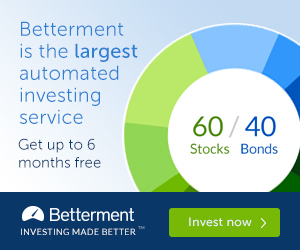 Today, I thought I would write about how I actually do invest in stocks. There will be several parts to this story. I decided to start with what I believe leads me to finding great quality companies and so I will begin this story with stock charts. Many investors have different ways of finding their favorite stocks, but when I read news on a particular company, the first thing I look at after finding the stock symbol is its chart. After over two decades of investing I can easily see from a stock’s chart whether or not I am wasting my time. A great stock exhibits a rising trend in its charts, but the key to great investing is finding stocks that are outperforming the major indexes. Below I have added the chart of Yahoo! (YHOO) for the last two years. 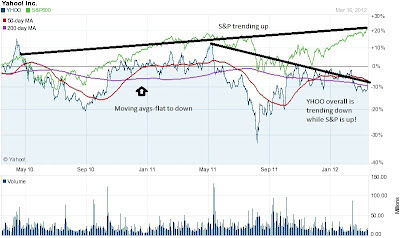 In the chart you will see that the S&P was trending up, while YHOO is trending down, this is obviously not a good sign, but also look at the stock’s moving averages, they too are basically trending down and again not a good sign. 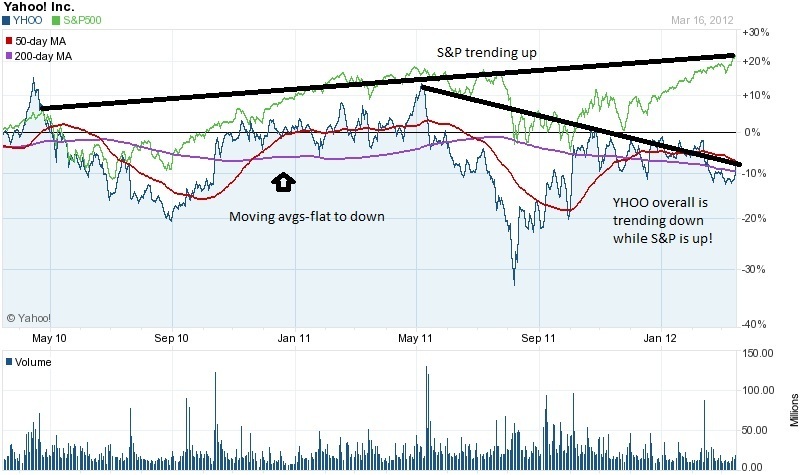 Overall YHOO could not trade with the market, so chances are Yahoo! has something wrong fundamentally with their earnings, revenue, debt, etc. I now know just from the charts that all is not right with this stock. A quick look at Yahoo!’s earnings and revenue the last two years show that chart is correct: Revenues and EPS have been decreasing---The stock and chart are broken, move on. So, now we move on from a terrible stock chart to a chart that shows great strength. 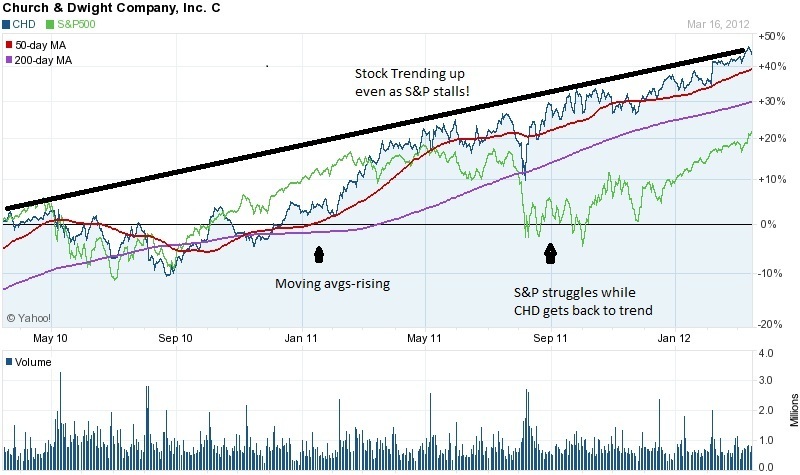 Below is the stock chart for Church & Dwight (CHD), the manufacturer of brands such as Arm & Hammer and Trojan condoms. 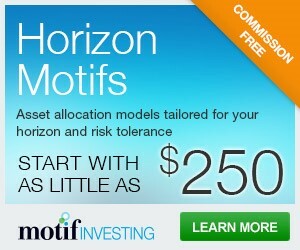 Here we obviously see some good signs, for one the stock is trending up with the uptrend of the overall market. 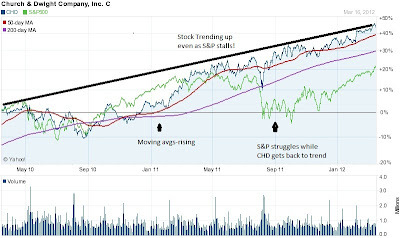 We also see that Church & Dwight’s moving averages are positive, but the one aspect of this chart that really makes me want to own this company is when it shows CHD managing to stay strong when the S&P struggles during August and September. After looking at this chart I would quickly see if company earnings, revenue and other fundamentals are in line with the performance of the stock. It turns out that revenues have increased from around $2.6 Billion in 2010 to estimated revenue of around $3 Billion in 2013 and annual EPS have increased from $2.22 in 2010 to an estimated $2.66 in 2013. Church & Dwight has a remarkable chart and an even better return (+40%) than the S&P 500; it would certainly be a candidate for ownership. In conclusion, Investing in stocks for me is a process and I believe that people should try to figure out where their process starts when evaluating stocks; for me it starts with a stock’s chart. I hope that I have helped some of my readers with this quick take on reading stock charts. Good luck and watch for my next part in this series. Hmmmm lets see in the past 10 years the several stocks that you have given me advice on to buy, and I listened to you, are showing a -600% return for me. While the ones you told me to not buy, or you didn't like are giving me a +720% return, once I remove Citibank from my list. Now I agree you have had a few winners but owning Apple doesn't make you an expert on stock trading, you ride the highs and pray for no major turn arounds in the market like bubbles and stuff. Now, now Mr. Torchio, I told you to buy and keep great stocks like AAPL and SBUX...but I can't hold your hands all the time....you are a stubborn one aren't you.